All right, I thought. I’ll try this. After all, I’ve been in such a trying mood lately. So I set up a time to go hang out with my mom and learn from her how to crochet. I don’t want to confuse anyone into thinking this is my first time at the crochet rodeo. When living in London, I bought a huge skein of yarn and a crochet hook and crocheted my then husband-to-be a 7 or 8 foot long scarf. Mom was across the pond and had no idea I was doing this, so I didn’t really have any guidance. I had the Internet. That was about it. 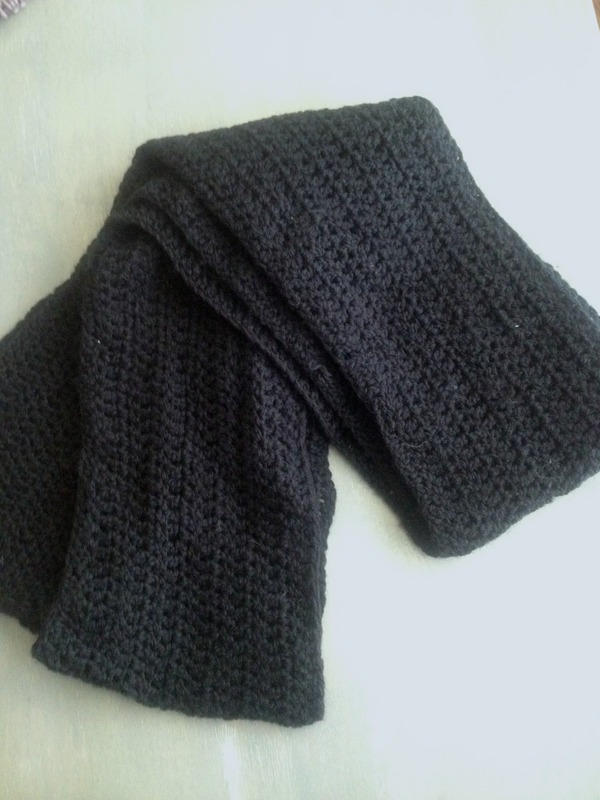 The scarf is done in black (best colour ever for trying a new needle craft, right?). I have no idea what the fiber was. Knowing my budget at the time, it was probably acrylic. I took this thing on the Tube with me to classes and during the nearly hour trip I would take to go visit husband-to-be in very South London. It kept my hands busy, but oddly enough, once the scarf was done, I had no desire to pick up another project. I tried again a year later with amigurumi (and the cutest punk pink elephant ever! ), but never really stuck with it. Mom does the crocheting in our family. I stick with knitting. So, mom and I sat down and made a swatch. I’m like, swatch? Let’s get to the project! Right. Like I have the patience for a full blanket when I got so frustrated over just the swatch. By the time we finished, I wanted to hurl the swatch into the fireplace. Instead, I gave it to my cat, Zebra. She seemed to appreciate it. 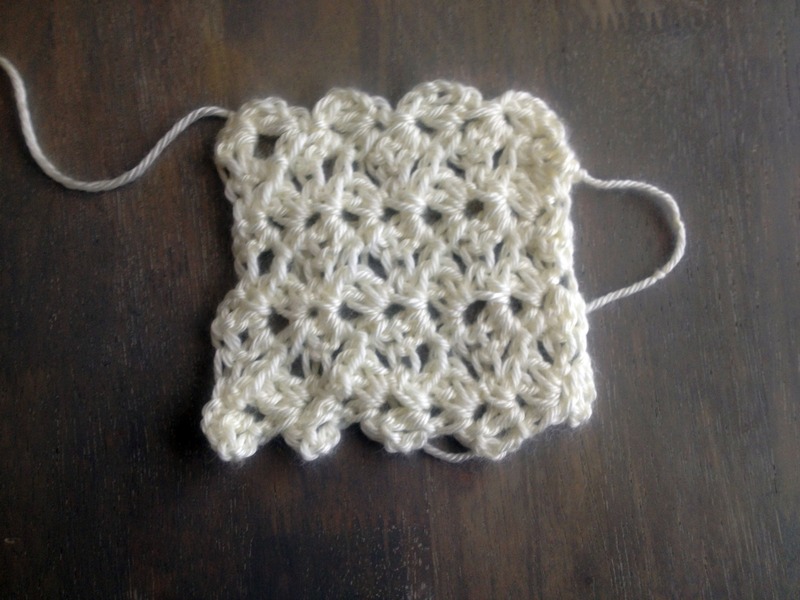 Despite a wonky swatch, I’m still considering giving crochet another go. After all, I was floored with how beautiful that baby blanket was. And how handy would it be to crochet a few of those up to have in the baby present stock pile? They’re so soft and lovely. My mom is also the crocheter in the family, but she tried knitting after I cajoled her into it. Now I feel I should return the favor, learn crochet from her. Besides, my daughter is a fiberphiliac and will want to learn it all. Good for you for picking it up again! My grandmother was the crocheter, my mom the knitter. Both were fabulous and created piles of lovely items. I learned to dabble with both techniques and am glad for the effort, because I was able to encourage my daughter to try them both. While I am still only a dabbler, but my daughter is becoming a master. We have concluded, however that crochet and knitting both have their strengths and weaknesses. Often we combine the two in order to get the best of both worlds and avoid the aspects we find less pleasurable. Good luck with your attempts and thank you for the pleasant blog.